TNFUSRC Admit Card 2018: Below are the admit cards published by TNFUSRC - Tamil Nadu Forest Uniformed Services Recruitment Committee / tnfusrc.in. The recent Admit Card issued for the recruitment drive is Forester Admit Card 2018. TNFUSRC Forester Admit Card 2018: Tamil Nadu Forest Uniformed Services Recruitment Committee has issued the Admit Card on 03 Dec 2018 for the exam which is scheduled to be held on 30 Nov 2018. 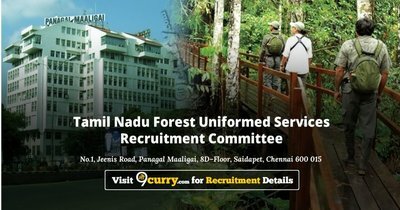 TNFUSRC Forest Guard Admit Card 2018: Tamil Nadu Forest Uniformed Services Recruitment Committee has issued the Admit Card on 03 Dec 2018 for the exam which is scheduled to be held on 10 Dec 2018 to 11 Dec 2018.